I have very fond memories of playing with my G.I. Joe’s and Construx on the carpet in the living room of my parent’s old New Haven home -their rug I now recall as an imagery world, that would encompass the area from under the bay window where lived in front a massive 16″ Quasar cabinet television, to the large wooden coffee table some twenty feet away that guarded the couch and love seat my father would sit on- as he watched whatever TV show or films would come through on the 37 channels supplied to us by our cable provider via the tethered, piano-like Jerrold remote control that reached across the living room. While laying on my belly playing with my Joes who were knee-deep in shag carpeting, I would gaze up and watch 100’s of films that would eventually go on to shape who I am today; seeing haunting glimpses of movies in that little tube-image, some of which I still do not now the names of. Occasionally I’ll wake up from sleep or see something while commuting to work, that will thrust be back into 16 Evergreen Court and onto that carpet, staring fixatedly at the unknown film that my father cared to watch. And then I have a new enigma to crack: to figure out all these years later by what I’d remember, to determine what film was I actually seeing as a bystander in that living room. These weren’t the regular fare of movies I’d see and know and remember- stuff you recall watching from beginning to end -films you were aware of the title, and stars, and plots of. These instead were just snapshots of images, sequences and vignettes that I would only partly see but would make such an impact, that they’re still with me even to this day. It’s taken me sometimes years, but I’ve figured out the names the images that I were burnt into my retinas like The Boys From Brazil, Rage, Scarface, The Last Man on Earth, An American Werewolf in London, and the topper, the Granddaddy of them all, the guy who I didn’t figure out until junior year of college, William Friedkin‘s masterpiece, Sorcerer. 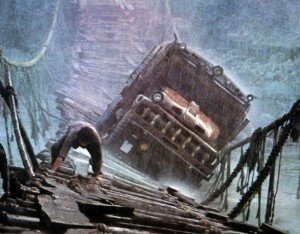 1977 Sorcerer film, il Lazaro truck on bridge, and a scene that for years haunted my memory until I was finally able to figure out what movie it was. 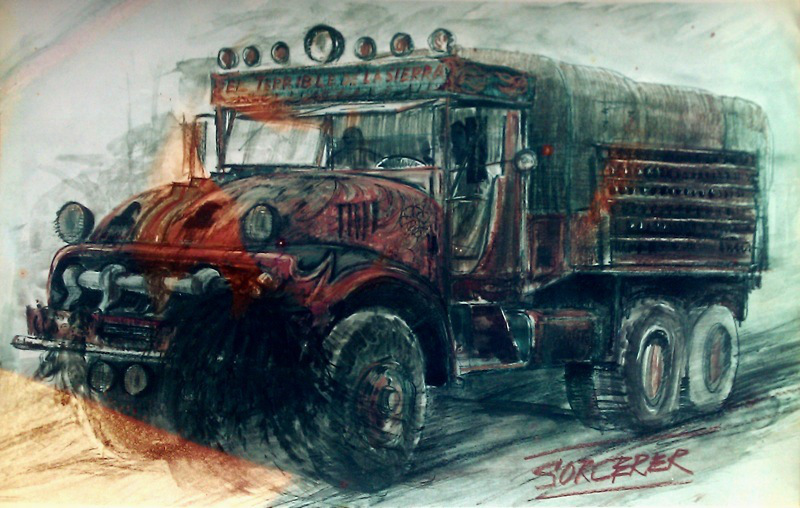 As stated in early articles here at The Podwits, my love for 1977’s Sorcerer grows every year with each viewing and I’d always dreamt it would be plucked from the fringes of movie purgatory that so many a great Hollywood film lies rotting and decaying a slow death in, and be restored to its formal glory. That finally happened last year when Friedkin announced he’d won the rights back from the studios that owned it, and at a Q&A at BAM theater that I attended, he announced he’d remaster and rerelease Sorcerer on DVD and Blu Ray so it could once again be viewed as it was intended. I was able to meet and briefly chat with Mr. Friedkin, and leaving it dawn on me: I am such a fan of the film and the original 1953 French version by legendary director Henri-Georges Clouzot, a nail-biting masterpiece entitled, Le Salaire de la Peur or The Wages of Fear, that I never tried to search out the book these films are based on and from which the 1953 movie takes its name, Georges Arnaud‘s Wages of Fear. I was first turned on to the French film in college while in theory class and that led me to the discovery of the actual name of the 1977 American remake, and I had always known about the original Arnaud book. As the story goes, Alfred Hitchcock had attempted to acquire the rights to the 1951 novel, but because of a clerical error Hitch was unsuccessful in obtaining the rights and French director Henri-Georges Clouzot who is widely known for his classic Les Diabolique (released just as Diabolique year in the states), was able to quickly scoop up the rights and bang out the 1953 film. 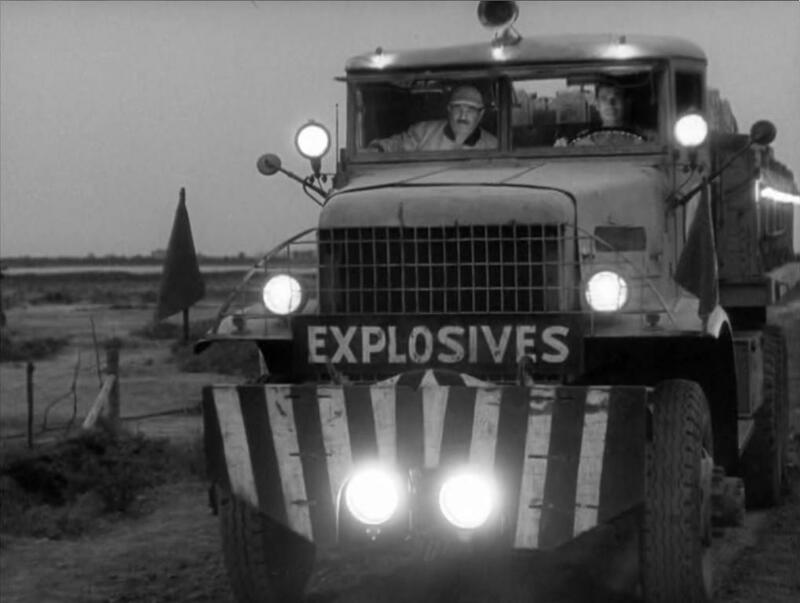 He version is widely hailed by critics as the most suspenseful film of all time- yes, an impressive title to hold. William Friedkin goes on to tell in his Q&A that when he wanted to remake Wages in the 1970’s, author Arnaud was thrilled because he evidently hated Clouzot’s version. Friedkin then went on to rename his film as Sorcerer (reportedly referring to: A) visually, the name of one of the two trucks, and B) allegorically deals with the idea that man has no control over his or her fate, and the name Sorcerer here represents another name for fate or an evil fate, and the lack of control a man eventually has over his life’s journey). The story is the basically same in all three incarnations: lowlifes from all over the world on the run for whatever reason, are now stuck in a dirt-poor South American town with no money or way of making enough dough to be able to get themselves out of the jungle hell of Las Piedras. Four are hired to truck unstable nitroglycerin across the rugged jungles and dilapidated roads of Guatemala to put out a raging oil rig fire; and when the characters are pushed, the story deals with the limits men drive themselves toward. Fear and death stare them in the face and the book shows how different people react to that situation; and in the overall scheme of things, our individual actions on this planet don’t really amount too much, and nor does the world even care to take notice. I had little hopes of finding an American translation of this French novel, but with some patience and an internet connection, I was able to find a great original 1953 American translation (superbly done by Norman Dale), complete and unabridged. 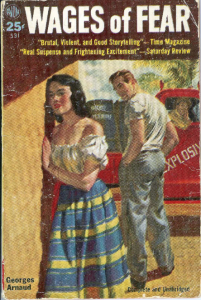 Released as a pulp novel (my copy pictured above), it completely inhabits the genre and gives us the best example of what a thriller can achieve when done right. Only a mere 156 pages, I think it should be used as an example of what can be achieved with only the bare minimum. The proses are tight, the story stays on task and really lives up to the ‘pulp’ status it was lumped into in the States. Unlike both films, who really spend the first and some of the second reels on character development and letting the audience in on who these thugs and criminals are, and why these men got to this Godforsaken town (whether shown in the ’77 version or only alluded to in the ’53 film), the book instead blows right past this and only spends the time it needs on establishing what the setting is, before the plot moves us forward. The very first scene in the novel is beautifully played as the tension is ramped right up on page one, as we read the recounting by the dying foreman about the Oil derrick’s explosion and damage and loss of life it caused. Also from the get go, we see the disregard the world seems to have on the pliant of these men, and this lack of caring, plays as one of the critical themes in Arnaud’s novel. You quickly realize you don’t need to know about these men, all foreigners stuck in this town that is run by an American oil company. As the story progresses, you realize the futility of the situation and why these men must get out of this town if they want to stay alive. 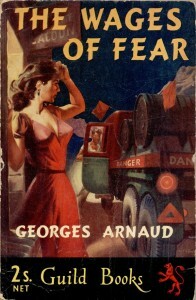 The story settles on Gerard, a Frenchman who seems to at first feed off of danger and is drawn to it. His eventual driving partner is Johnny, a wannabe tough guy who quickly shows to be a coward in the very first problem they encounter. Here is where Arnaud lets the character development happen, where loathing is born out of Gerard’s contempt of having just a useless cohort who folds into a crying, bumbling shadow of a man at the first sign of real danger. As they proceed, they endure many obstacles ranging from potholes, to sheer cliff drop-offs, to natural climate and terrain of South American. But as the journey unfolds Gerard adopts a kinship with his partner, and even when he is injured and all looks lost, Gerard is able to muster up the strength (and courage), to drag Johnny back onto the truck and navigate the perils they still both face. The suspense is magnified with Arnaud’s details regarding the inner workings of the trucks themselves. His knowledge of how these beasts work -their stubborn clutches, clunky transmissions overworked suspension systems and gear boxes- all minute details that immediately give the reader a confidence when absorbing the material that the author knows what he is talking about- making the drama on hand all the more realistic and then tension therefore all the more nail-biting. It is difficult to find a lot of background on Georges Arnaud, but he was accused of killing his father and aunt, spending over a year and a half in jail before he was cleared of the charges. He moved from France to South American during the war, and speculation is that it is there that he worked as a truck driver, and learned his intimate knowledge of trucking, and the roads and terrain of South America. 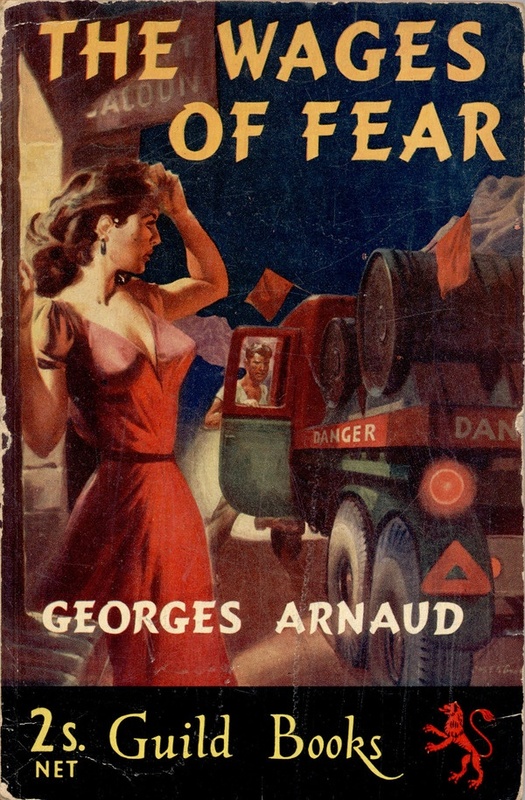 One of the most exciting and suspenseful sections is the book’s climax (which also ended up being translated quite well in the 1977 film adaptation), in which Arnaud magnificently captures the madness Gerard is brought to by exhaustion, hunger, and heat stroke; a delirium he shares with us as he pushes on, driving his truck on the last leg of their route, quite literally a zombie. Like any great hard-boiled story, the book wraps up in true film noir fashion, giving us a bleak ending and not so much leaving us with any kind of uplifting feeling about the world we live in, but more with the realities of our life and what destinies fate will more-to-often deal us out. Aside from the gut-wrenching conclusion, I think the real travesty here is that Wages of Fear is the book is no longer available. 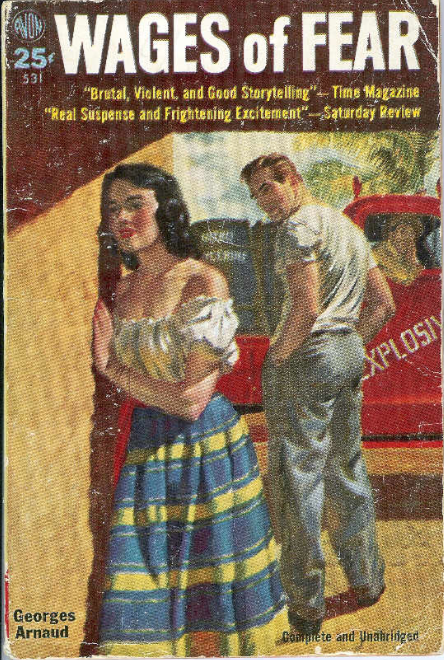 Released in the UK in an English translated hard-cover in 1952, then as a paperback edition in 1953 and then again in 1958 (only now under the title Flesh and Fire ), and after that has sporadically seen the odd re-release with various covers, with some having fine examples of pulp art, while others look very much like a product of their time. It seems all too often books like these, or Chester Himes‘ Harlem Cycle series of novellas for example, which seem not like fictional stories but more like documentaries which chronicle these dark, chilling tales, fall by the wayside so that more popular authors of the pulp or noir genres (if you even want to categorize them as such) can be instead thrust into the limelight. This is to take nothing away from the Dashiell Hammett‘s, Raymond Chandler‘s, Mickey Spillane‘s or James M. Cain‘s of the world. Georges Arnaud or Chester Himes can certainly be put into their categories, inhabiting that dark, realistic and brutally, honest world. 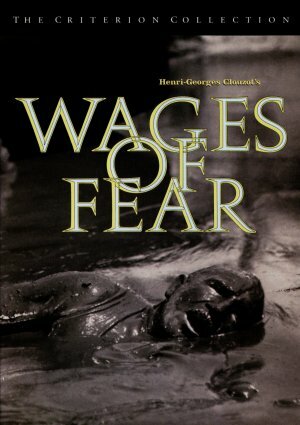 Some do not like to read this genre because it touches to close to home, but certainly for a book like Georges Arnaud’s Wages, they should be a novel readily available and even taught in school as it’s film versions are. Hopefully, one day Georges Arnaud’s Wages of Fear will be easily available so all generations can discover this masterpiece.